Following completion of their successful Kickstarter campaign to bring Leadwerks’ game development software to Linux, Leadwerks has announced the release of Leadwerks Game Engine for Linux on the Steam distribution platform. 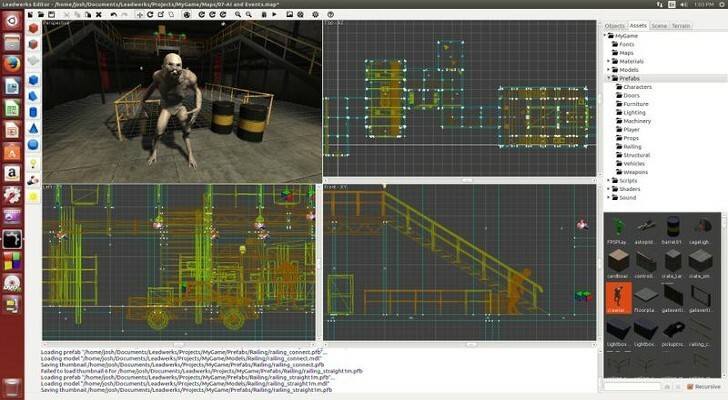 This provides Linux users with a powerful tool to easily create their own 3D games. Over the last year, Leadwerks has focused on desktop Linux as a platform for creating and playing games. For many users, Leadwerks provides the last missing application they need to move entirely over to Ubuntu or another Linux-based OS. With Leadwerks for Linux now available on Steam, developers can build and play games without ever leaving Linux. Bringing Leadwerks Game Engine for Linux to Steam means that existing games can be more easily deployed to Linux. The Leadwerks Game Player allows users to play games published through the Steam Workshop. In most cases, games developed for Windows can be played on Linux with no changes and no recompiling, due to Leadwerks’ platform-agnostic design. Linux support also opens the door for Leadwerks developers to publish games to the living room. Last year Valve Software announced the SteamOS, a Linux-based operating system for game consoles. Although SteamOS is still in development, Leadwerks for Linux and SteamOS promise to provide indie game developers with a way to deploy their games to the living room quickly and easily. Leadwerks Game Engine is a powerful and easy to use development tool for building 3D games. The software has recently grown in popularity due to its ease of use, royalty-free license, and strong support for C++ and Lua programming. Thanks to the quality of modern Linux graphics drivers, Leadwerks is able to deliver high-end 3D visuals on Linux with an advanced deferred renderer using OpenGL 4.0. The Indie Edition of the software can be purchased on Steam for $99.99. Leadwerks Software was founded in 2006 to build powerful game development tools that are easy to use. The company launched Leadwerks 3 in April 2013 at the GDC expo. Last summer, the company conducted a successful Kickstarter campaign to bring Leadwerks to the Linux operating system, reaching over 200% of their goal in just six weeks. A concurrent Greenlight campaign for Steam was also successful, making Leadwerks the first 3D game engine approved for distribution on Steam. In June of 2014, the Leadwerks Game Player on Steam opened the door for indie game developers to publish their games to the Steam Workshop, with no waiting period and no approval process. Although it’s been available on Steam for less then a year, Leadwerks users already have a dozen games and concepts on Steam Greenlight.